European countries extended their airspace restrictions on Saturday, choking international air travel and stranding thousands of passengers, as an Icelandic volcano continued to spew ash into the atmosphere. London, England (CNN) -- European countries extended their airspace restrictions on Saturday, choking international air travel and stranding thousands of passengers, as an Icelandic volcano continued to spew ash into the atmosphere. Airspace over the United Kingdom and Belgium will be closed until Saturday night, according to the British air traffic control provider NATS and the Brussels Airport. British Airways canceled all flights to and from London for all of Saturday. Several flights from North America due to arrive at British destinations Friday night were headed to Scotland instead, the airline said. Irish budget carrier Ryanair canceled all flights to northern European destinations and Milan, Italy, until Monday because of the ash, the airline said. 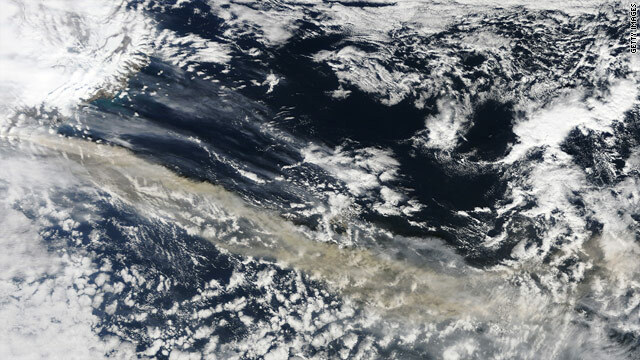 The ash cloud is drifting south and eastward over Europe. Although barely visible in the air, the ash -- made up of tiny particles of rock, glass, and sand -- poses a serious threat to aircraft, stalling engines and causing electrical failure, experts have said this week. Past incidents of aircraft trying to fly through volcanic ash clouds and suffering damage and engine failure led European officials to shut their air spaces rather than risk a catastrophe, said Joe Sultana, an official at Eurocontrol, the intergovernmental body that manages European air travel. "I cannot say whether it's an overreaction or underreaction," Sultana said Friday. "I think everybody is working in the interest of safety. We understand the impact to the airlines ... but safety comes first." It was unclear when the situation would end, because the volcano was still erupting and spewing ash Saturday, said Agust Gunnar Gylfason, a project manager at Iceland's Department of Civil Protection and Emergency Management. "We cannot tell how long an eruption like this will go on," Gylfason told CNN. The eruption began March 20 beneath the Eyjafjallajokull glacier in southern Iceland, blowing a hole in the ice. It worsened this week, forcing local evacuations and eventually affecting European airspace. CNN's Melissa Gray contributed to this report.